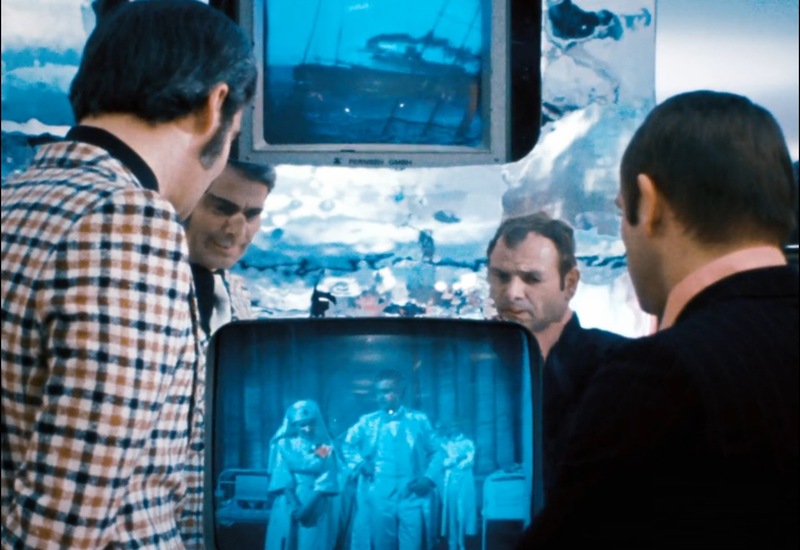 Rainer Werner Fassbinder’s World on a Wire (1973), which recently screened at Philly’s International House, expects a February DVD/Bluray edition from Criterion, and deservedly so for its contemporary resonances, unexpected humor, aesthetic brilliance (even if it is a bit long in the tooth). This two-part TV adaptation of Daniel F. Galouye’s sci-fi novel Simulacron-3 predates another of director Fassbinder’s massive undertakings for the small screen, Berlin Alexanderplatz (1982), and like it, has all the scale and craft of cinema. The relationship between these two adapted projects is that which scribes them into the Occupy Nowhere family: the centrality of “a man apart,” who uses something akin to the Zen practice of negation (more on that in part two) to affirm his personhood within systematized alienation. For recently released prisoner Franz Biberkopf, exiled to the Alexanderplatz district of 1928 Berlin, negation means a self-aware effort to “go straight” no matter the overwhelming prevalence of corruption and coercion; a challenge against his own criminal identity. In World on A Wire, set in a technocratic future where virtual reality is tapped as a market research tool, the Institute for Cybernetics and Future Science’s Dr. Fred Stiller’s act of negation is aimed at the very tenets of his physical Being (“Being” as both a noun and a verb), and of the two presents the more fundamental existential query. 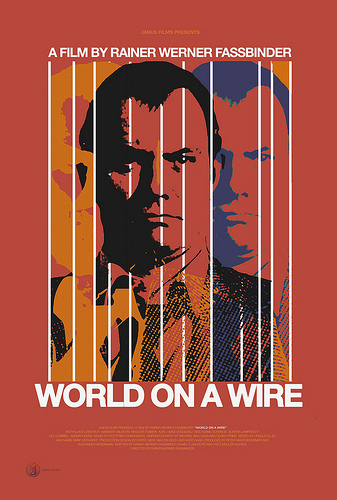 World On A Wire is an anachronistic treasure of dystopic future storytelling that has elapsed its temporal leap, but is only slightly askew in its positions and premonitions about man’s undoing. Wire is the story of cybernetics engineer Fred Stiller, a man who doesn’t know that he is “occupying nowhere,” what “nowhere” encompasses, but sparks to life as he exposes the pervasive nature of that exile. Wire is also the story of Simulacron-3, a self-evolving virtual city devised by the Institute for Cybernetics and Future Science (IKZ) to mirror the real world. Like “the strangers” in Dark City (1998) who supernaturally manipulate the architecture of a perpetually nocturnal city and rearrange the memories of its inhabitants for study, IKZ Scientists code conditions and events into the fabric of the Simulacron city, populated by 8,000 identity-units; virtual humans imbued with idiosyncrasies and “something like consciousness.” That like-consciousness is so convincing that the identity units are unaware – save for one deliberate implant called Einstein – that they are collections of electronic impulses in a computer. Operators download into Simulacron-3 via a digital avatar in order to observe, effect change, or extract information from Einstein. The rippling impacts of events that are programmed into Simulacron are used as microcosmic predictors for future policy changes in usage of resources and commercial trends in “real world.” Particularly interested in this information is the company United Steel. The film begins with an anxious Professor Vollmer, technical director of Simulacron, who is in possession of a distressing secret. Moments after bequeathing his secret to IKZ’s security officer, Günther Lause, Vollmer meets a mysterious end. Vollmer’s successor, Dr. Fred Stiller, has a discussion with Lause at a party about his mentor’s suspicious death, but Lause disappears (without trace) before he can share Vollmer’s apparently preposterous theory. Things get even stranger when, much to Stiller’s frustration, the IKZ employees seem to have no memory of Günther Lause. Accumulating inconsistencies with the media, selective amnesia, disappearances and reappearances of characters, a gaggle of emotionally near-automaton women (including Stiller’s appointed secretary) and general ambiguities press Stiller to eventually suspect everyone of conspiracy, including the overall intent of the IKZ, if not the fabric of his own reality. 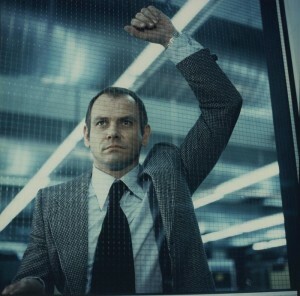 To this effect Wire unravels like All The President’s Men (1976) blended with Brazil (1985), dipped in neon blue. Stiller escalates in his suspicions the more he uncovers about the “wires” that the film’s title infers about. Fassbinder’s film is a veritable Russian Doll. The director renders worlds within worlds literally, and through a potent visual language. His persistent use of mirrors, glass surfaces and enclosures, compositional fragmentation, diegetic visual distortions, and frames within frames (such as TV monitors) lend themselves to both conspiratorial fractures of information, and of multiple realities. Brilliantly kitschy sets, location shooting, a textural soundtrack, and the modern chic of a gliding camera create a clinical sense of urgency and a rich sense of place (more accurately no-place). 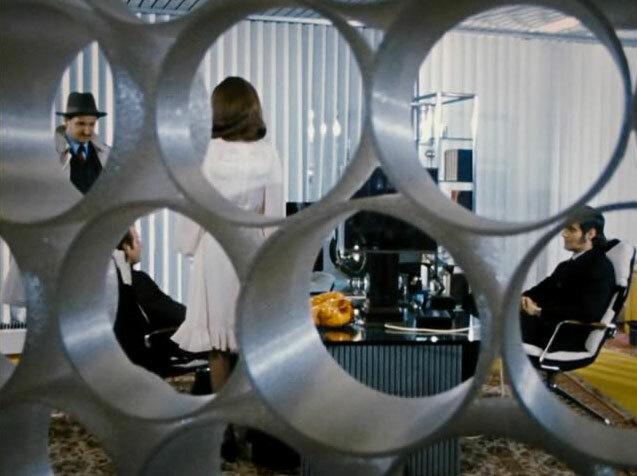 Above and beyond the unambiguous corporate critique, Fassbinder’s ultimate concerns here are about the manipulability of information/perception and the flaws in the architecture that we erect around reality (ie. technology, commerce, bureaucracy, routine). Through the abuse of a virtual reality enterprise, Wire questions where intrinsic human-ness lies or where “so-called reallity” occurs, and supposes the evolutionary apex at which our probing, framing, and manipulating of reality leads to perceptual and spiritual collapse. Wire also infers that removed of its sci-fi shroud, the machinations and abuses that unfurl within the film are mere variations of those which can and do occur in our reality, and have everything to do with the correlation of identity and technology (internet/social media) and also commerce. If unseen or unquestioned, we find ourselves Occupying Nowhere, just as unawares as Stiller before his “fateful” promotion.